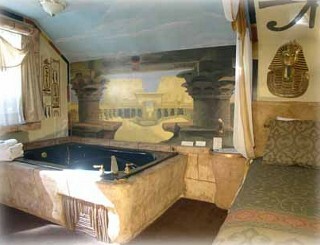 Hand painted hieroglyphics on the walls, temple of Karnak mural behind the Jacuzzi, sandstone walls, half canopy bed, King Tut's hand painted masks, papyrus artwork, sandstone shower for two. Wood burning fireplace, Jacuzzi for two, microwave, compact refrigerator, TV, queen size bed, in-room coffee maker, and hair dryer. "August 20, 2005, was our five-year anniversary. My husband decided to come here. Believe me, we enjoyed ourselves. 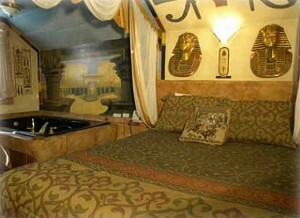 The theme of the room was exceptional. To the owners and staff of Castlewood... We loved our stay here and everything was great. Your service and the way the room was set up was marvelous."